Solar south is a key component to passive solar heating and other strategies. So, how does one find it? I was perplexed. Once a First Class Boy Scout, I was well versed with using a magnetic hiking compass. Was my compass not telling me the truth? This notion was a revelation to me at the time. As it turned out, true South – and by “true” I mean relative to solar orientation – can be significantly different than what a magnetic compass may indicate. This is due to a phenomenon known as magnetic declination. Convection currents flowing in the outer molten core of the Earth generate a magnetic field, the poles of which do not necessarily coincide with the geographic poles of the planet. In fact, the degree of variation in the continental U.S. can be as high as 20°. In other parts of the globe, magnetic declination can be much higher. Interestingly, in some locations, magnetic declination is negligible. 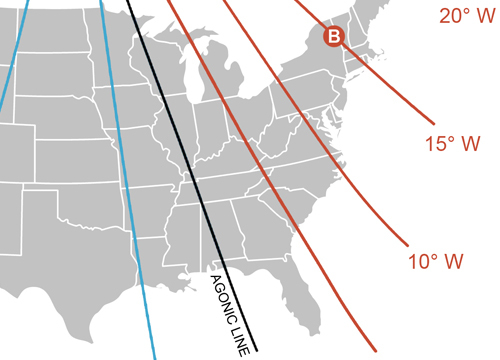 In aggregate, the routes created along these locations of 0° declination are referred to as agonic lines.